In less than 24 hours 24 puppies have found themselves homeless and in need of help from Fresno Humane Animal Services. Three separate litters from 2 Fresno County areas: Miramonte & Malaga. Three litters of pups totaling to 24 pups in all. Fresno Humane got calls from county residents feeling overwhelmed with a puppy pile-up as stray dogs are having puppies on their property. 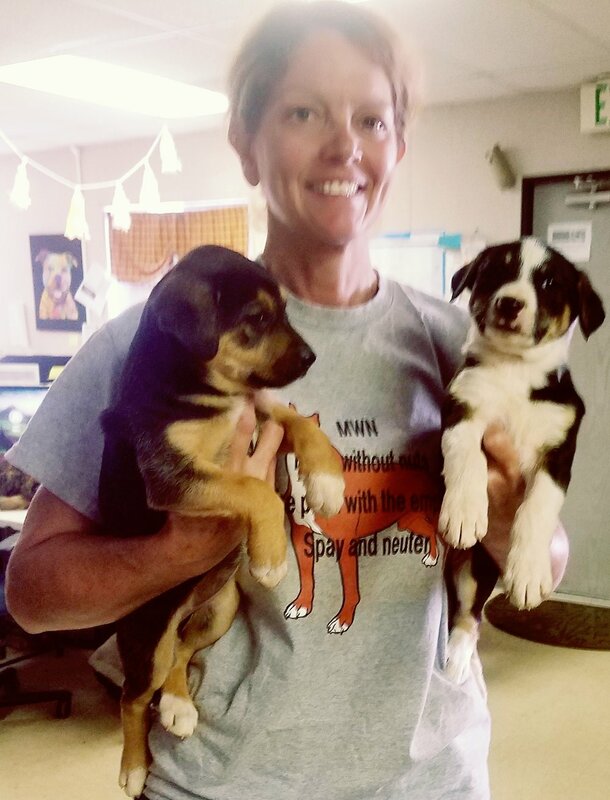 In addition to taking the puppies, Fresno Humane has offered to assist these families capture the stray moms and offer spay assistance to prevent more litters of puppies in the future. Fresno Humane wants to remind people that we are here to assist stray dogs in Fresno County. If you spot stray dogs running loose call us to help before things get out of hand! We offer low-cost spay and neuter assistance to Fresno County residents to prevent unwanted litters. We are also a safety net for thousands of Fresno County animals as we work long hours to send dogs to our rescue partners both local and beyond. One of our rescue angels answered our call for help! February 6, 2016. Had a wonderful day at Fresno Humane Animal Services (FHAS)! Dr. LeeAnn Dumars, DVM vaccinated and microchipped approximately 41 dogs and even a few cats too. We offer to the public 2 types of dog vaccines: DAPP (Distemper, Adenovirus, Parvovirus and Parainfluenza) and a Rabies vaccination, as well as a microchip, all for only $25 per dog. Why is this important to FHAS? Fresno Humane Animal Services is on a life-saving mission to keep dogs safely in their homes. VACCINES: If dogs are up to date on vaccines they won't be spreading deadly diseases throughout the community and if they come into our shelter their immunities will be built up to protect them. This helps FHAS to give healthy dogs back to their owners, or to community rescues, or placed into adoptive homes. We want to be a safe place for animals and these vaccination clinics help to get vaccines into rural communities. MICROCHIPS: If dogs get out of their yard and they have a microchip there are a lot of different animal organizations and veterinarians in the community that can scan for a chip and call the owner to pick up the dog right away. This leaves space in our kennels for the dogs that need us. Dogs with microchips usually = safely home by the end of the day. Sadly, dogs without microchips wait for their owners to come looking for them. Many people don't even know where to look when they loose their dogs and this leads to an overpopulation of homeless pets. Bottom line is microchips save not only your dog's life but the life of the dog that is in our kennel, as we don't have to make room for your dog. Also...Vaccine Clinics are an opportunity to educate the public of the importance of spaying and neutering. We offer low-cost spay/neuter vouchers and it gives us a platform to talk about what steps they need to take to get the service done. So, why is spaying/neutering so important? It prevents unwanted litters. Fresno County has an over-population of dogs and cats. Approximately 100 dogs and cats die in our city and county each day. Several of those that are euthanized are large breed dogs such as Pit Bulls, Pit Bull mixes, Shepherds and Shepherd mixes. The more we are out in the community preaching about the importance of spaying and neutering and offering a low-cost option to do so, the less these beautiful animals have to die in shelters. Dr. LeeAnn Dumars, DVM vaccinated this beautiful Shepherd. Brenda is scanning the dog for a microchip.